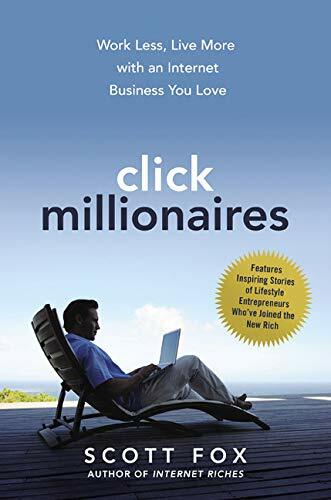 Click Millionaires by Scott Fox has its virtues. The absence of naked self-promotion is not one of them. Book review tip: If you’re cringeing, breathe deeply and read on. Mr. Fox’ core thesis for success is to tap into a niche that excites the infant webmaster and create an Internet business around it. What sort of niche? Mr. Fox warns against creating a site that is too broad in scope as one would encounter too much competition. And he particularly favors “relationship-based online communities” for their participant engagement. His flagship example of this is a site called BackYardChickens.com, a cyber-locale where urbanites and suburbanites who breed and raise chickens mingle, generating about 11 million page views per month. And indeed, the Internet business model exemplified by this site, one that is in full accord with Mr. Fox’s credo, is certainly one viable approach to making money online. But contrary to Mr. Fox’s advice, it most certainly is not all that is left for the legions who did not create iconic sites upon the birth of the Internet. Was Google not founded by two MIT students with limited resources when Yahoo! and others already dominated search? And did Facebook not emerge to replace MySpace on the social media thrown? Admittedly, Scott Fox’s target audience may not be equipped to create such ambitious enterprises. Still, the presence of competition does not singularly doom a web venture to failure. Despite all this, as noted, Mr. Fox does provide one model for starting an Internet business, with several variations on the core approach. Yet even here the book falls short in failing to describe many of the practical requirements of an Internet business that must be considered for succeeding online. For example, there is no focus on search engine optimization. Of course, one volume cannot contain all of the information required to perfect a website. But the book errs in not identifying the core competencies it does not cover. Search engine optimization warrants a separate book on the topic, such as Search Engine Optimization For Dummies, a good beginner’s book. Partially offsetting this lapse, Mr. Fox does at least identify certain other tactics for driving traffic to one’s site. Mr. Fox does provide some lists of critical webmaster tools, such as “popular” website and blog building utilities, but does not provide information about most of the resources on the lists, so that it is left to the nascent webmaster to evaluate these. Choices such as to which web-building software to use have significant ramifications for how one’s site will perform due to the presence or absence of important attributes on each of the listed platforms. In addition to providing sound, if incomplete, advice on much of the creation of a profitable website, the book is usefully peppered with descriptions of certain popular and lesser known resources. One of the latter is kickstarter.com, a site that facilitates the funding of selected for-profit startups/projects with no strings attached. Others include one of a number of sites where a webmaster can source royalty free images, email collection tips for an email campaign, the sourcing of free content, and website evaluation resources. For many readers Click Millionaires is best skimmed before deciding whether or not to embrace Mr. Fox’s Internet religion. But one must read further to fill in the gaps before taking the plunge. For a more experienced webmaster, a quick read will no doubt provide information on a handful of disparate website resources not yet discovered. And no doubt in investigating the scottfox.com website one will discover additional ones. Of course, there is prominent linkage to his other sites, such as ExpertWebsiteReviews.com (one of the website evaluation resources he describes in Click Millionaires), where one may receive a website review for $99. Book review tip: Buyer beware.